Clients who have been with us for many years know that this blog ‘Riding the Rockies’ began back in 2010 when I began spending some time in the Colorado Rocky Mountains cycling. That time spent in the saddle of a skinny Italian bicycle has historically provided me with the solitude that’s sometime required to find balance and to ensure that all systems are functioning at full capacity, whether climbing Independence Pass or ripping down the long sweepers on Tennessee Pass at eye-watering speeds. My hope, in writing this blog, is to provide a sense of perspective when it seems like the momentum in the markets is withering, causing us to wonder why we are placing hard-earned capital at risk in the markets. As many of our clients, some who have been with us for over 20 years, are aware, this is a slow climb in a world that demands instantaneous gratification. As we also are aware, the descents that come occasionally can be fast and furious. We don’t know when they are coming which is why we tend to look critically at our risk levels and work to match them against your risk limits using our new “Riskalyze” technology. 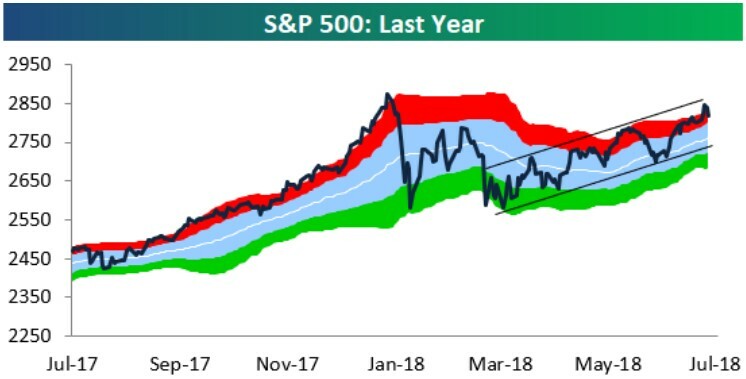 Bulge bracket firm, Morgan Stanley wrote today that they believe that we are witnessing the start to a strong corrective (-10% or more in the indexes) period in the markets. So where do we stand? First, August is historically a lousy month for stocks with volatility typically rises during the month. Traders are at the beach or in the mountains and money flows in the markets are lighter…globally. So, volatility is not of any surprise to us. We think that the recent volatility accompanied by some FAANG earnings misses, most notably from Facebook is also representative of traders repositioning their portfolios before month end so that they can go on vacation without having to look too frequently at their positions. Since March we have witnessed the S&P 500 move from oversold territory back up into extreme overbought territory. A quick review of S&P sectors shows all but materials, telecom and energy trading at the top end of their valuation ranges. As earnings for the last quarter come in largely better than expected, those ranges should be adjusted upward. A real concern, however, is that the FAANGs have become overvalued and overweighted in many of the popular indexes like the DJIA, S&P 500, Russell 1000, and Nasdaq. When this happens, the risk is that these positions may drive a disproportionate move to the upside or, the downside. If the FAANGs reprice, as it appears they may be doing, these indexes will be disproportionately moved by these handful of stocks. There are a variety of factors that ETF providers can use to try to outperform an index, ranging from volatility, momentum, earnings, growth measures and beta, among others. Many ETFs invest in accordance with Smart Beta indexes. Smart Beta indexes tend to use factors other than simple market capitalization weightings. Given the fact that the top 10 stocks in the S&P 500 represent overweighted positions in overvalued stocks, we’ve worked to reduce volatility through the deployment of Smart Beta indexes. There are some places where we have not rebalanced our more traditional indexed positions, primarily due to tax considerations for our clients, but, we are at a point where we will begin to trim because of some of the potential issues caused by the way these cap weighted indexes are constructed. We know that there is always the chance of a correction…in fact, in almost every single year, there has been a period of decline of 10% or more. We witnessed that this past January. Despite exceptional earnings from many index components, we may, however, experience that again this late summer. As I have written previously, however, there is some significant precedent for a strong rally, especially if the party in power remains in power, following the midterm elections. Yes, there is much that we are on the ‘lookout’ for as we continue ‘Riding the Rockies’. California housing sales have tumbled 12% in recent months (CNBC), Amazon’s facial recognition system falsely matched 23 members of Congress with arrest mugshots (Buzzfeed), Twitter’s subscribership is down (Twitter) and according to Paywall, luxury homeowners are retreating to sensory-depravation tanks in droves. But, here at Alpha Beta Gamma Wealth Management, we continue to believe that fundamentals really drive stock prices in the long run; we believe that stocks generally outperform bonds over time; we believe that adding principal protected investments can actually generate portfolio gamma (see our explainer video at www.abgwealth.com) and we believe that in spite of a handful of companies in the tech sector, publicly listed American companies are outperforming their international peers for the most part. Accordingly, we remain overweight in U.S. stocks, are trimming emerging market stocks slightly, remain underweight bonds both in the U.S. and internationally, and are underweight real estate and alternatives.